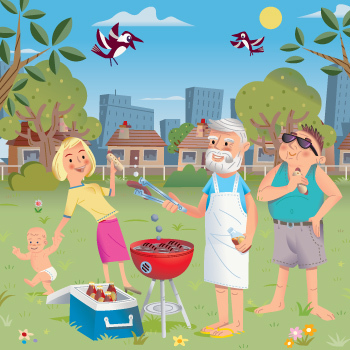 Summer brings out barbecue grills, at home and at the campground. It also brings out bacteria, which multiply in food faster in warm weather and can cause foodborne illness (also known as food poisoning). Following a few simple guidelines can prevent an unpleasant experience. Don’t marinate on the counter — marinate in the refrigerator. If you want to use marinade as a sauce on cooked food, save a separate portion in the refrigerator. Do not reuse marinade that contacted raw meat, poultry, or seafood on cooked food unless you bring it to a boil first. Keep hot food at 140 degrees F or above until served. Keep cooked meats hot by setting them to the side of the grill, or wrap well and place in an insulated container. Keep cold food at 40 degrees F or below until served. Keep cold perishable food in a cooler until serving time. Keep coolers out of direct sun and avoid opening the lid often. Cold foods can be placed directly on ice or in a shallow container set in a pan of ice. Drain off water as ice melts and replace ice frequently. Don’t let hot or cold perishables sit out for longer than two hours, or one hour if the outdoor temperature is above 90 degrees F. When reheating fully cooked meats, grill to 165°F or until steaming hot. This article appeared on FDA's Consumer Updates page, which features the latest on all FDA-regulated products.